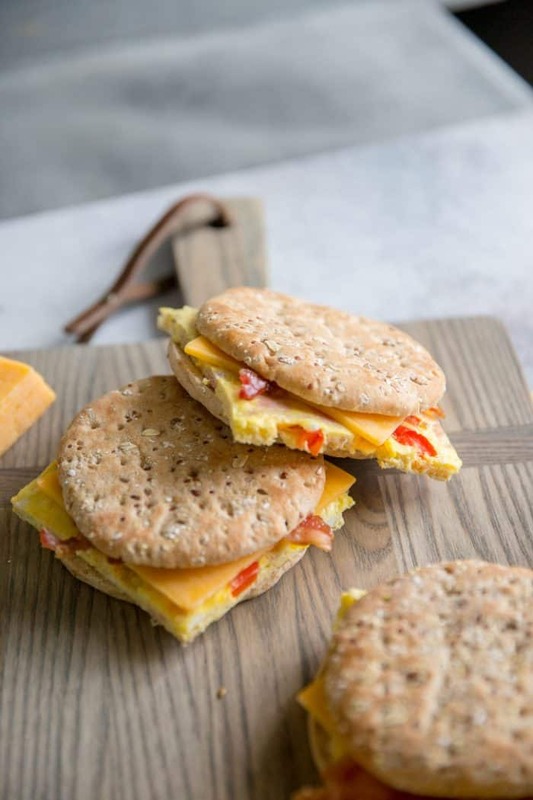 The classic Denver omelet makes short work out of breakfast when it is tucked inside a breakfast sandwich! This is a simple solution for busy mornings! 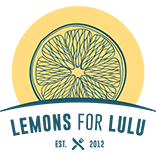 I’m proud to have partnered with Ohio Poultry to bring you this recipe. We start school in 3 weeks!!!! Do I sound just a little excited? I am….just a little. Don’t get me wrong, I love having my kids home for summer break. I enjoy having them near me, hearing them laugh, seeing them hang out with their friends and doing things as a family. BUT they are noisy, messy, and hungry people who need either rides or cash every day. The kids would totally argue this, but at this point in the summer they start to show signs of needing routine. I’m pretty certain I’m showing signs as well. We are all creatures of habit and without those habits and routines, we all go a little nuts. I’m ready for the morning rush, the homework, the busy evenings, the extracurricular activities too! I say bring it on! 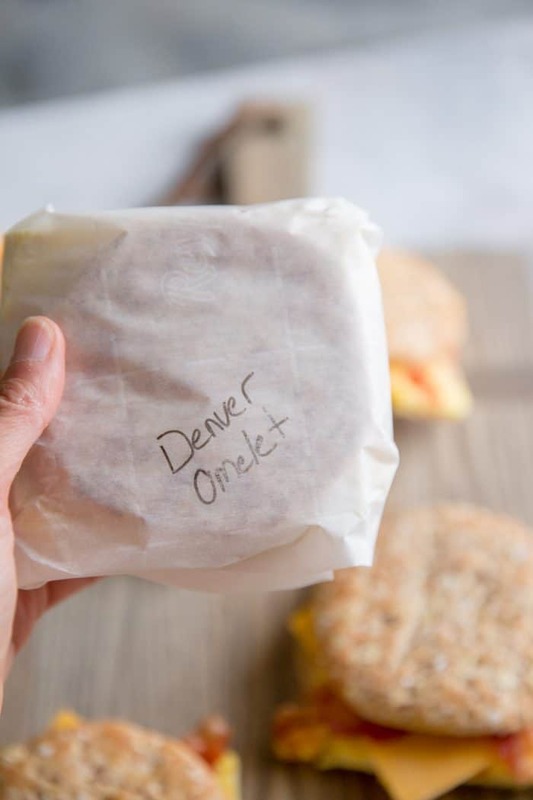 To combat the breakfast battle I will keep the freezer stocked with these Denver Omelet Breakfast sandwiches. 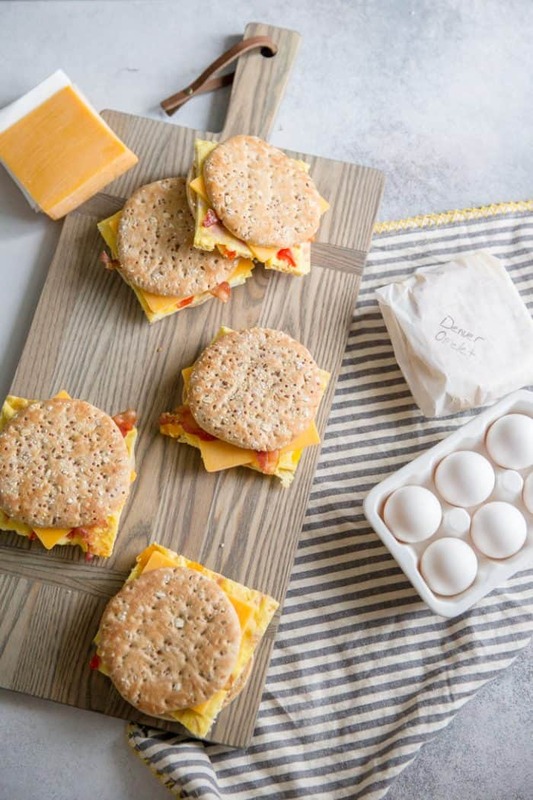 These sandwiches are super easy to throw together (you bake the eggs in a sheet pan), wrap and freeze. 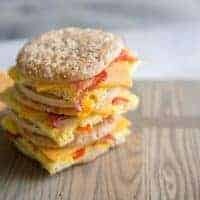 When your family is in need of breakfast all they have to do is pop them in the microwave and eat on the go! This recipe will yield six sandwiches, it can easily be doubled, however. I did whisk all the omelet ingredients and poured it onto a well sprayed 10 x 15-inch baking pan. The eggs will only need about 15 minutes to set. I used red peppers and orange peppers, but those could easily be changed out for your favorite peppers. I did not add cheese to my eggs until I assembled my sandwiches, but feel free to add shredded cheese during the last few minutes of baking. If you would like to freeze these sandwiches, assemble the sandwiches, wrap them securely in parchment paper (be sure the sandwiches have cooled completely). When ready to eat, unwrap the sandwiches and microwave for 45 seconds or until heated through. On busy school days, eggs are a great thing to wake up to! Eating a protein-rich breakfast keeps kids stay full for hours. One large egg contains 6 grams of high-quality protein! Eating a healthy breakfast can result in better memory, improved mood and less absences from school. Too often, however, kids miss out on important nutrients from their morning meal, such as protein. Prep for the week by making a batch of hard-boiled eggs to pack in lunches and use in recipes such as easy egg salad. Watch this easy-to-follow to find out how to make the perfect hard-boiled eggs! Preheat the oven to 400 degrees. Spray a 10 x 15-inch pan or a 9 x 13-inch pan with non-spray and set aside. In a bowl, whisk together the eggs, the peppers, ham, salt, and pepper. Pour eggs onto the prepared baking sheet and bake for 12-15 minutes or until set. Remove and allow the eggs to cool. Butter and toast the buns if desired. Cut the eggs into 6 squares (trimming as necessary or desired). Place the egg squares on the bottoms of each bun. 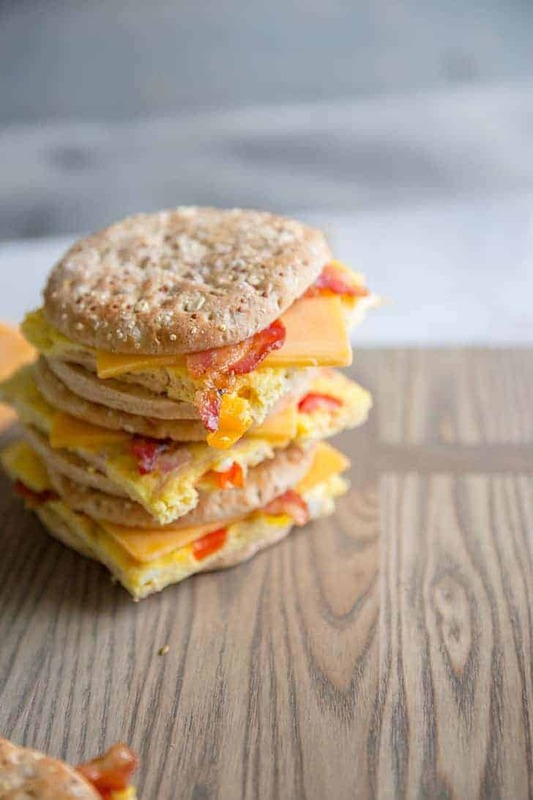 Top the eggs with sliced cheese, bacon, and remaining sandwich bun. If you are going to freeze the sandwiches, be sure all your ingredients have cooled completely. Assemble the sandwiches and wrap in parchment paper. To reheat, unwrap sandwiches and microwave for 30-45 seconds or until heated through. 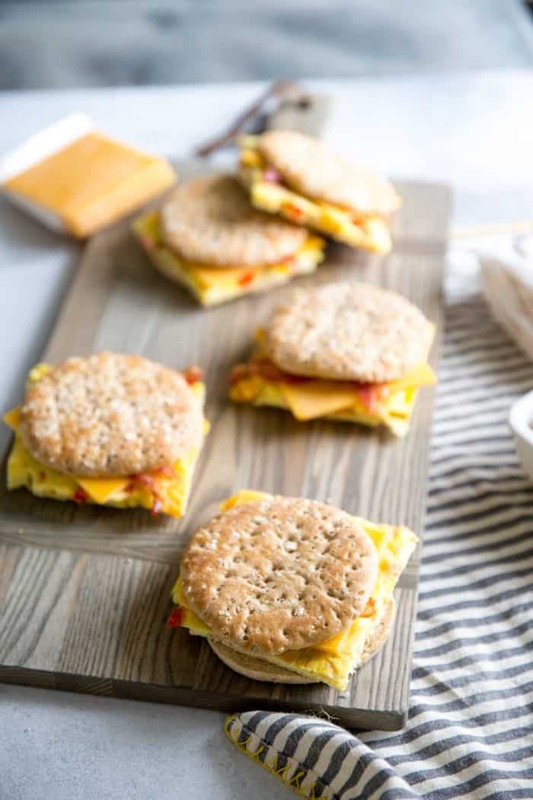 I love breakfast sandwiches, so this recipe is right up my alley! Thank you for sharing this with us. I love how you can make these ahead of time, perfect for those crazy mornings! This is such a nice idea for breakfast on the run!